May 30, 2018 • In a recent study, published in Ecological Applications, researchers investigate how advances in remote sensing technology can be used to predict and monitor algal blooms before they turn harmful. Using satellites that detect chlorophyll, which is present in algae, they are developing ways to monitor water quality from outer space. Road runoff, lawn treatments, and agricultural chemicals fuel algal growth in water bodies. When algae blanket a lake’s surface, loss of sunlight and–eventually–oxygen, smothers aquatic life. The result: scummy ponds that look like putting greens and smell like decomposition. Concerns aren’t only aesthetic. Harmful algal blooms (known as HABs) can become toxic to humans and wildlife, making water quality monitoring a concern for municipalities and businesses that rely on clean lakes and the ecosystem services they provide. 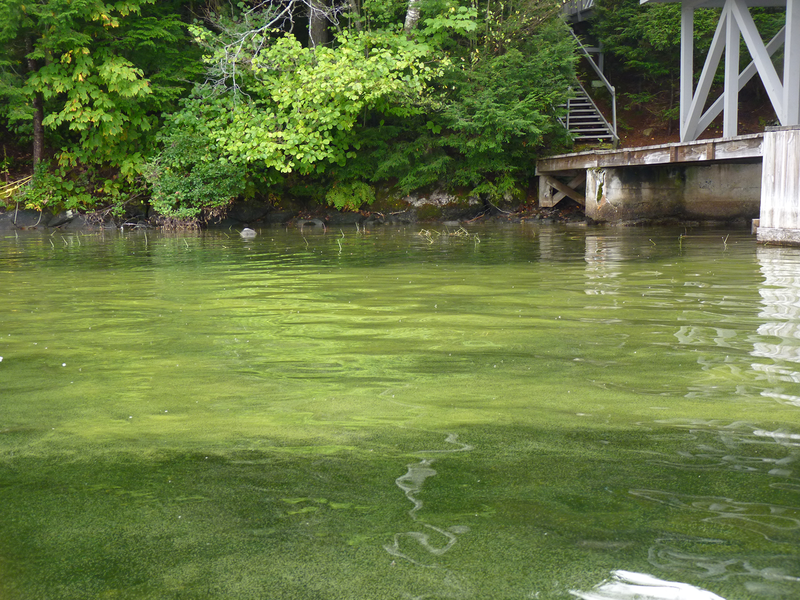 Timing is important; HABs can occur quickly and present a sudden threat to lake users. Accurate prediction requires geographically broad, high-frequency data sets. 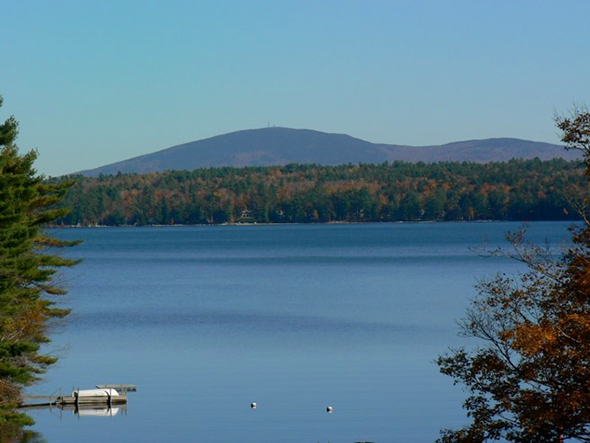 Lake association volunteers collect data on many lakes in the northeastern US; however, periodic sampling on scattered lakes does not provide enough data to identify regional trends and forecast blooms. The solution lies in pairing in-the-lake observations with satellite data. Since the 1970s, NASA’s Landsat satellites have collected images of the Earth’s surface. These satellites are equipped with instruments that detect electromagnetic wavelengths, organized into spectral ‘bands’. These bands correspond with reflectance values, which provide information on surface and near-surface features such as photosynthetic activity and temperature. Landsat 8 is the program’s most recent mission. 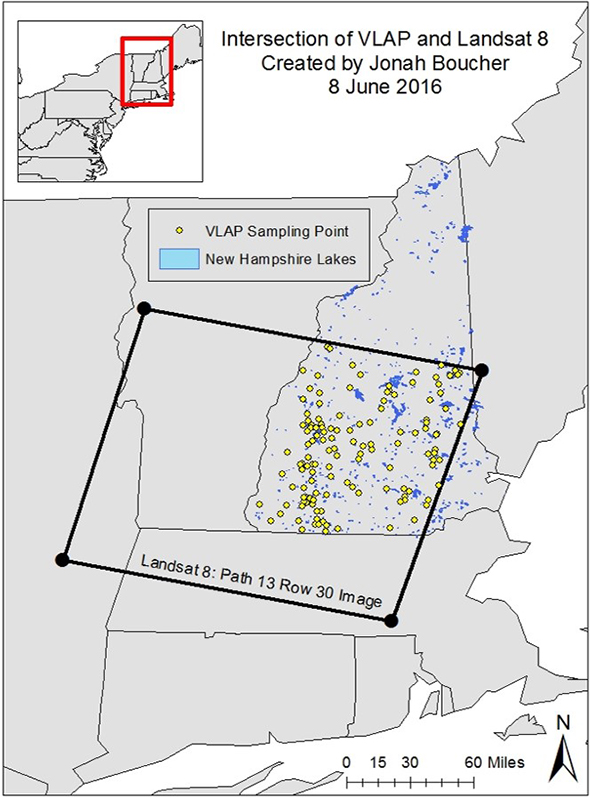 The team used the USGS EarthExplorer website to collect Landsat 8 images of regions of Maine and New Hampshire that have lakes with active volunteer monitoring programs. These images are comprised of data-rich pixels which hold information about the surface of the Earth. Through statistical processing, this information can reveal estimates of chlorophyll-a concentrations in lakes. Researchers have developed a variety of algorithms which establish different mathematical relationships between Landsat 8’s reflectance bands to estimate chlorophyll concentrations. In this study, the team tested six such algorithms to determine which produce chlorophyll-a estimates that most closely match those obtained from direct lake sampling. Remote sensing is not a perfect system. Cloud cover, haze, dust, and other particles suspended in the atmosphere present challenges to collecting the clear, high-quality data required to detect algal blooms. 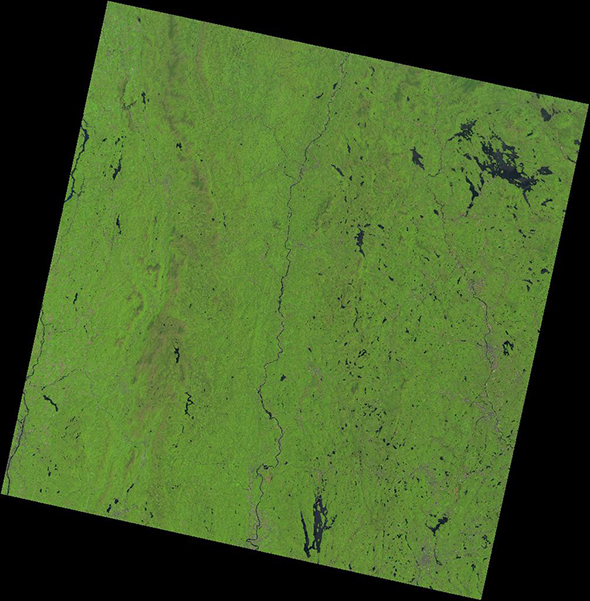 However, Landsat is continually adapting its instruments to overcome these obstacles. In-lake sampling is still the most reliable way to monitor water quality, but there are thousands of lakes in the northeastern US alone which do not have volunteer monitoring groups or are too difficult to access for sampling. “Despite water pollution management efforts throughout the region, toxic algae blooms remain a threat to human and ecosystem health. We need to put rapid detection and response measures in place. With increasing improvements in satellite technology and finely-tuned methods of mathematical processing, forecasting algal blooms is within our reach. This study brings us one step closer,” says Weathers. Boucher, Jonah, Kathleen C. Weathers, Hamid Horouzi, and Bethel Steele. 2018. “Assessing the effectiveness of Landsat 8 chlorophyll a retrieval algorithms for regional freshwater monitoring.” Ecological Applications:1–11.